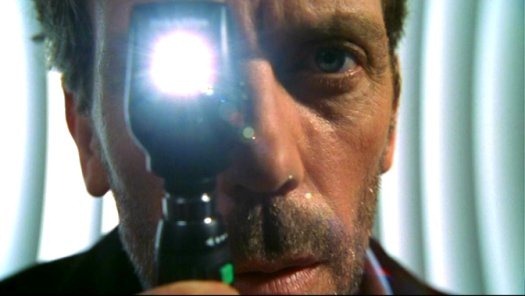 The next episode happens to be one of my favorites because this is one of the few cases where House’s flights of diagnostic fancy is actually comprehensible to my mere intelligence. Also, there is this one thing I have to ask: in diagnosing SSPE, can we take a trans-pupillary retinal biopsy by poking in through the eye? My normal medical curriculum never taught me anything like that. Is there anything like this for real? Any insight is appreciated. And now, on to the plot. Once again, thank you Wikipedia! When a clinic patient claims to have an appointment for his clinic session, House is skeptical of the letter which House himself apparently wrote to the family. House realizes that it was written by Cameron but listens when he hears that one of the symptoms is night terrors. The patient, Dan (Scott Mechlowicz), is a 16-year-old lacrosse player who has been recently hit in the head in a game. House had first dismissed the symptoms as concussion and then suggests that the cause might be post-traumatic stress due to sexual abuse. But then he notices Dan’s foot twitch with a myoclonic jerk which normally only occurs when falling asleep. He immediately admits Dan and starts diagnosis with his team. House claims that Dan’s father isn’t his true biological father and makes a bet with Foreman about it. Soon after, Dan has another night terror. None of the tests show why the night terror occurred, but House finds a large blockage in one of Dan’s brain ventricles. House and his team relieve the pressure as fast as they can, but they find that the blockage isn’t what is causing the other symptoms. It is in fact a symptom itself. During the night, Dan is found missing from his bed. Cameron, Chase, and Foreman search frantically to find him, soon locating him on the roof, where he is hallucinating that he is on the lacrosse field. Chase tackles him just before he steps over the edge of the building. House is excited by this new development — it rules out House’s previous diagnosis of multiple sclerosis. The new diagnosis provided by Cameron is neurosyphilis. To treat this, they inject penicillin directly into Dan’s brain, but during an injection, Dan suffers an auditory hallucination, which rules out this diagnosis. House is stumped by this new development, and admits his problems to Wilson. Dan’s parents are angered to discover House having coffee with Wilson while their son is dying, but House rebukes them with his intimate knowledge of Dan’s current condition. He tells them to go and support Dan, after which he takes their coffee cups to run DNA tests to decide his bet on Dan’s paternity. The tests show that neither parent is biologically related to Dan (winning House his bet with Foreman, Wilson and everyone else who wagered on Dan’s paternity), and a new idea hits him. He remembers a baby he treated earlier whose mother did not want to vaccinate the child. House thinks that infant Dan caught the basic measles virus from his biological mother (who possibly had never been vaccinated) that had mutated, remained latent for 16 years, and reappeared in his brain. Avoiding a dangerous brain biopsy to confirm this unusual case, they biopsy Dan’s retina to find the virus, confirming House’s diagnosis of subacute sclerosing panencephalitis. Dan recovers fully, and reveals that he already knew he was adopted, due to his cleft chin (which neither parent has), but that he doesn’t care and loves them. At the end of the episode, it becomes apparent that House must have played lacrosse sometime in his youth (having the nickname “Wheels” and wearing the #18.) He is shown at what appears to be Dan’s lacrosse game but at the end is shown to be on his own when the camera reveals the field to be empty. He clutches his cane like a lacrosse stick, seemingly dreaming about days past. The treatment for the final diagnosis was to inject interferon into the brain. This treatment requires consent from the patient’s parents. The story exaggerates the difficulty of explaining this treatment for dramatic effect but the problem of obtaining informed consent in complex cases is a real one. Tags: Episode Plots, House MD, PostADay2011, SSPE. Bookmark the permalink.